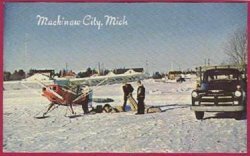 Title: Winter Transportation to Mackinac Island, Mich.
Shows a pontoon plane and a Chevy truck. Getting plane ready to deliver goods to the Island. Pub. by Hiawatha Card Co., Ypsilanti, Mich. Color by Lucy Gridley.